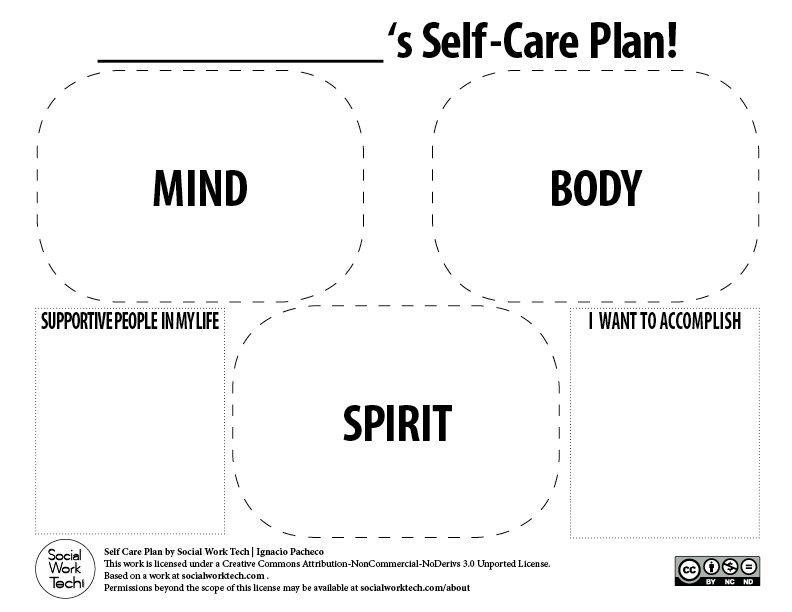 Making a Self-Care Plan for You and Your Clients! During my last semester in graduate school, I developed an intervention I am proud to share with you all. It’s a self-care plan that I implement with my clients, as well as in my personal life. My colleagues loved it and many of my clients have embraced it. This intervention is tangible, as it can be taken home by the client to put on their wall or refrigerator – a practice I encourage as a form of buy-in to their treatment. This intervention leads the client in identifying their needs for their mental, physical, and spiritual self. It then helps the client to identify important people in their support systems and goals they wish to accomplish (in therapy, in general, etc). This proved to be an excellent tool with other clients who may not see a counselor over a the summer break (my final year internship was at a University). I have three versions (see: Downloads). Two are downloadable for utilization on an iPad drawing app (I use Brushes for iPad) and a third version is in .PDF for you to print out. I did not watermark these images, so please do not resell them. Check out more of my Self-Care Plan and downloadable content for your own self care and for clients, after the break! As the creator of this intervention (surely, there must be others similar to this), it was important for me to integrate concepts that I have been preaching to my clients. In essence, I bought into developing a self-care plan out of a necessity for preventing burnout and promoting my own well-being. The same self-care plan you saw in the video (and below) is hanging on my wall. Why? It is because I often try to practice what I preach to my clients. Especially when I’m not feeling well (i.e. irritable), I run an inventory on my own self-care plan and usually, a lack of sleep is the culprit! But that’s just one example. I encourage social work instructors, supervisors, and colleagues to take this (or a similar intervention) to promote this concept of self-care among helping professionals. See below to download in PDF, JPG, and PNG! Self-Care Plan by Social Work Tech | Ignacio Pacheco is licensed under a Creative Commons Attribution-NonCommercial-NoDerivs 3.0 Unported License. Permissions beyond the scope of this license may be available at socialworktech.com. And to those in, starting, or ending school, congratulations on your journey so far! We made it! This is really great…thank you!!!! Great post! Self-care is so critical for social workers–we are often focused too much on caring for others in our lives to the point of neglecting ourselves. I like this post so much that I’m going to suggest to our faculty that we add your post to our Self-Care Starter Kit (http://www.socialwork.buffalo.edu/students/self-care/). Thanks, that’s very gracious of you! I just emailed them again to let them know that. You know, you might want to consider putting a copyright with your name and also a creative commons license on the pdf itself. People end up copying this type of thing and they can easily lose cite of the source. Ignacio – this is very creative and I love that you made it so that it works on an iPad. Is it okay for me to show it to my clients? Thanks – I have a feeling you are going to change a lot and come up with new theories to help everyone – go for it – we need new eyes and new ideas! Go for it with your clients! I just used it in session today with one of my own! This is a really great idea! I have been trying to figure out how to use more technology in my practice as a social worker. Thanks for the great tip! This is awesome! The agency that I am interning at does a “Mind, Body, and Soul” group and this fits right in! I just printed 20 copies for my classmates and talked to my Supervisor about it! Amazing tool!! I think this will work with my kids and teens!! I’m also thinking of adding it to my vision board activity I do with my high school age clients! Thank you so much for this resource! Hi there! I am doing a presentation on self-care for individuals with mental illness seeking employment. I was hoping to use your worksheet during my presentation. Of course, I will reference your work. Would this be ok with you? You did a great job with this. The only thing I ask of people that want to use my materials is to not modify my files (for example to take out my logo), sell my materials, or claimant is their own. Again, thank you for asking and for checking out my website! This is WONDERFUL! I can’t wait to use this. Thank you so much for sharing!!! 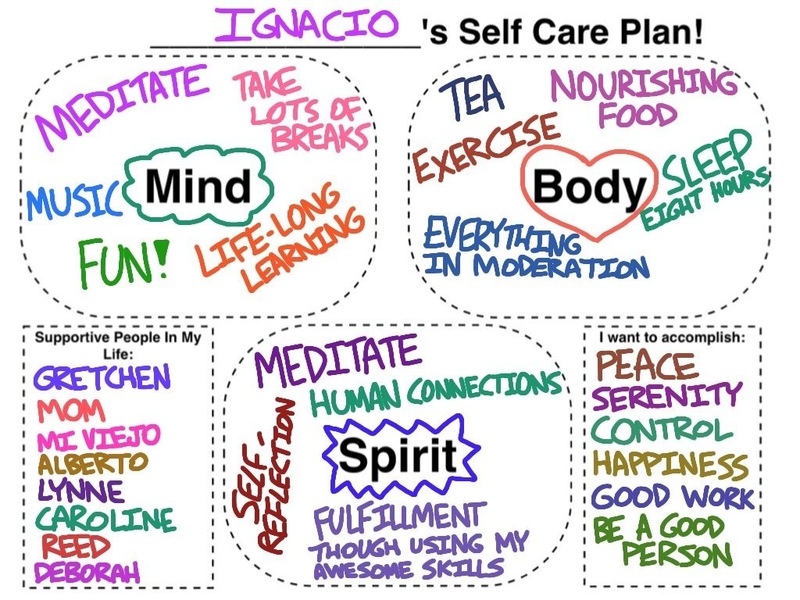 Fantastic self-care plan, Ignacio. I love the colors and how visual it is. I am going to link to your site as an example of a self-care plan in the blog post I’m writing on the subject. Thanks! I want to thank you for this tool. I am teaching a religious school class for teens with special needs, and we are trying to teach the mind/body/soul connection. This is a great way for them to see a visual and set goals for themselves. I am looking for a picture to use for our new self-care FB group for IU School of social work, would you mind if I use your picture ? If you are in agreement can you let me know exactly how you would like it sited, if I use it as my main FB pic. I am not sure how to add it there.